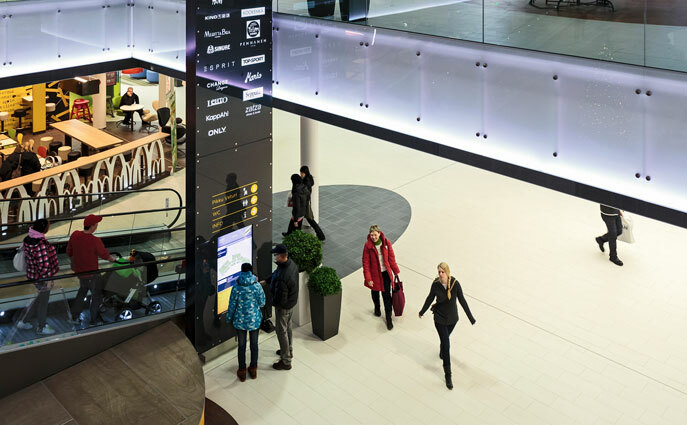 The newest shopping center in Helsinki attracts customers with large digital displays. Learn more about REDI and get to know our other references. 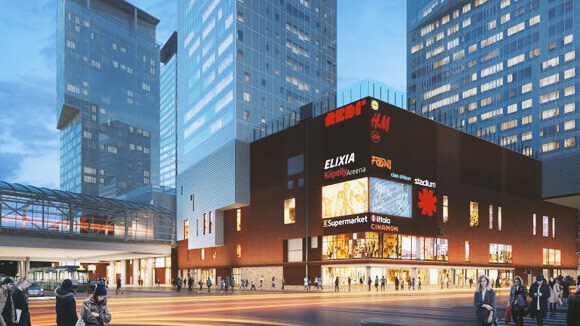 The REDI Shopping Center, opened in September 2018, is located in the fast-growing Kalasatama neighbourhood in Helsinki. It is part of SRV's over-all plans, which includes eight towers and a parking facility. Upon completion, REDI became the largest and most modern shopping center in the city and its range of Digital Signage contributes to that. REDI has invested heavily in large digital displays for advertising and communication purposes. There are a total of ten Craneworks LEDs, of which half are installed inside the shopping center and half on the exterior walls. Of the displays, the most modern and most impressive is the seamless angle design of two LEDs on the exterior walls. 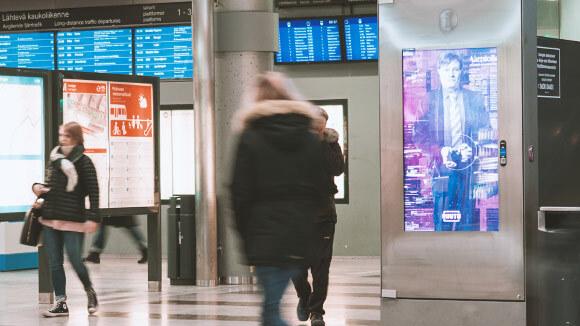 According to REDI's Marketing Manager Heli Vainio, digital advertising displays are not only a major source of revenue for the shopping center, but also an important channel to inform shoppers about events and other happenings. 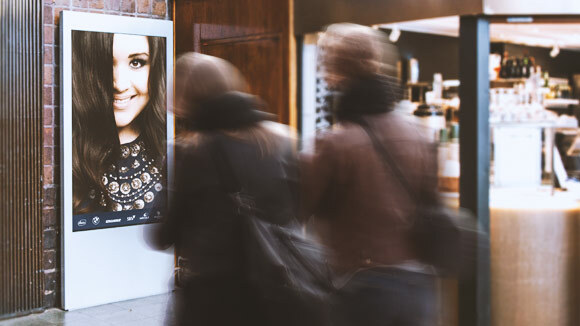 Utilising informational displays and LEDs for communication and marketing makes REDI one of the Nordic's most significant digital-based shopping malls. Outdoor advertisement in Redi is done by five LED-screens from Craneworks. The most impressive one is the seamless angle design of two LEDs mounted on the corner of the Hermannin Rantatie and Leonkatu intersection. It allows for a new kind of visual expression when it is presented both individually and across both displays. In addition to the LEDs, we also installed 15 informational displays. The digital totem displays inside are customized to Redi's look and feel and function both as touchscreens and as digital advertisements. Redi utilizes five LED-screens for Indoor advertising. Versatile content played on big screens in good locations is an efficient way to reach and entertain different target audiences. Lahti University of Applied Sciences became a digital forerunner after opening the brand new campus. 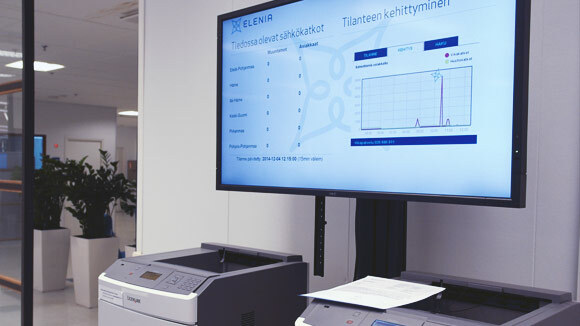 Lahti became a more attractive student town after LAMK, Lahti University of Applied Sciences opened a new, digitalized campus in September 2018. Along the remake LAMK became one of the most advanced schools in terms of learning environment. One of the key factors of the digital remake is the Digital Signage implementation. It includes LED-screens, video walls, info screens and Wayfinding totems with touch screen. Contents are administered and displayed by BCN Digital Signage system and the guiding is done by BCN Dynamic Wayfinding system. LAMK uses Digital Signage system for versatile communication purposes. 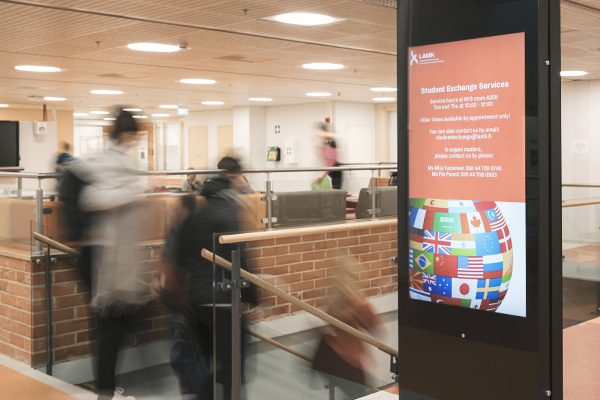 Digital Signage is part of the university’s ecosystem, where future’s studying techniques, working life, responsibility and digital solutions meet. The campus area works as a multipurpose center where the university units and partner companies locate under the same roof. A LED wall of 3.8 x 6.5 m was installed at the entrance of the new campus. A good visibility is granted for the advertisements and other contents with 25 m² screen. 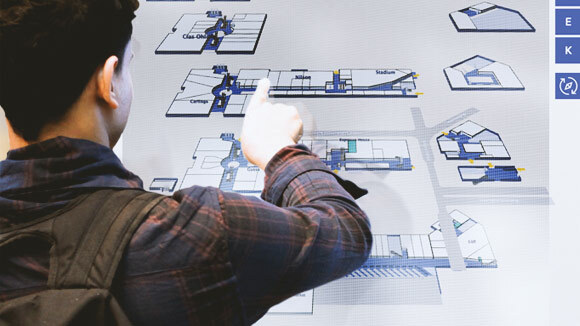 Interactive routing is an important part of LAMK’s Digital Signage solutions. Altogether nine touch totems with BCN Dynamic Wayfinding were installed in the university’s premises. Finding the way to a class room or other places is now easy and efficient for the students and visitors. With Digital Signage screens the university can for instance advertise their events or show opening times and classroom bookings. The students are involved in planning and producing the contents making Digital Signage a channel for learning and creating. The Tallink Megastar ship started sailing between Helsinki and Tallinn in January 2017. Craneworks installed an extensive Digital Signage system in the end of the shipbuilding project. Learn more about implementing Megastar and get to know our other references. Tallink Megastar is the seventh cruise ship launched with Craneworks Digital Signage. Megastar is Tallink Grupp LTD's newest shuttle ship made by Turku Meyer Shipyard 2017 on the Helsinki-Tallinn route. The ship's power source is LNG, ie liquefied natural gas. The ship is 212.2 meters long and its 12 deck can accommodate a total of 2800 passengers. 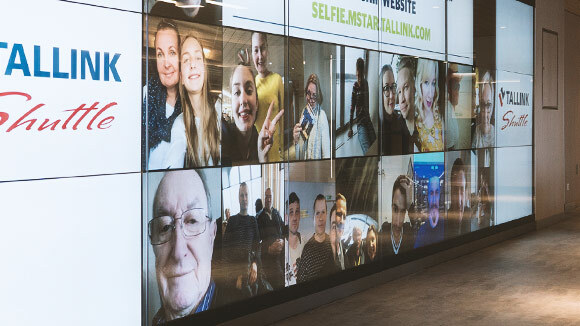 Tallink Megastar is perhaps by it's Digital Signage, the world's most modern and comprehensive cruise ship. There are more than 200 displays Craneworks has designed and built. Onboard the DS complexes are placed in lobby areas, lounges, shops, car parks and restaurants. The implementation includes a total of 130 info, ad, price lists and menus, as well as 15 video walls (2x2). The huge videowall display that has 18 screens is located in the Megawalls entrance of the ship. The gorgeous Megawall is equipped with Craneworks designed and implemented Selfie Wall software that lets the passengers send their own selfie from their mobile devices to everyone to see on Megawall. Selfie application has gotten much attention and is currently very popular among travelers. Tallink Silja Oy is part of the AS Tallink Group, one of the largest passenger and cargo shipping companies in the Baltic Sea region. The company operates ships under the Silja Line brand from Helsinki and Turku trough Åland to Stockholm. In addition, Tallink Silja Oy sells ships operated by AS Tallink Grupp, which operates under the Tallink brand for example on route from Helsinki to Tallinn.Tallink Silja Oy operates in Helsinki, Turku and Tampere and is a subsidiary of Sally Ab in Mariehamn. The company employs approximately 500 people on land and about 1000 people at sea. Video walls have been installed around the Megastar ship for a total of 15 pieces, in several different locations and in several different sizes. The biggest and most beautiful of them is in the entrance, Megawall. 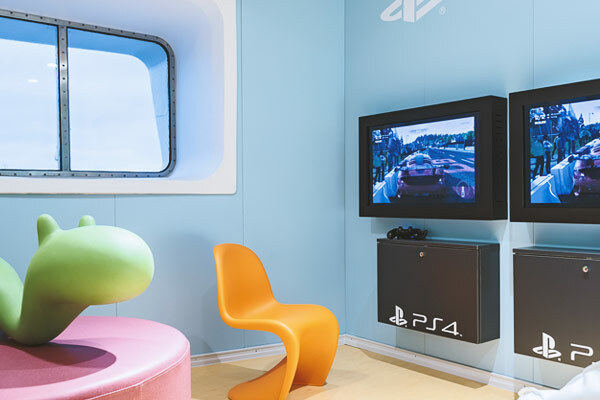 When the layout of the displays is taken into notice during the construction, different display solutions can be planned to be embedded in the furniture. There are several of them in Megastar, both in the Taxfree area and in the restaurants of the ship. The megastar DS chopper is a special Megawall, which is located on the entrance of the ship with 18 displays. It is equipped with Craveneworks designed and implementated Selfie Wall software that allows passengers to send selfies from their mobile devices to all passengers to see. Selfie application has attracted much attention and is currently very popular among travelers. 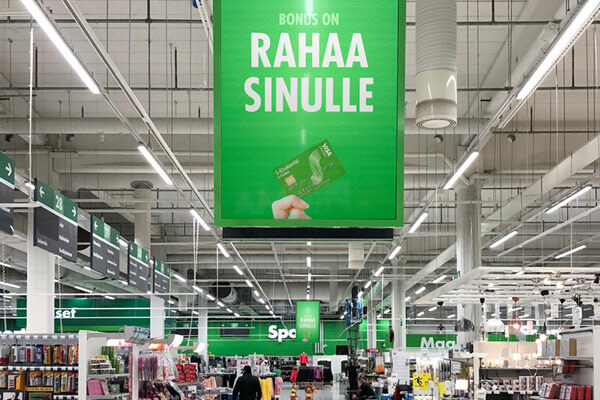 The S-Group chose Craneworks as its nationwide partner to implement the largest digitization of advertising in Finlands' store network. In the Store Digital project S-Groups stores, the Prismas, S-markets, Alepas and Sales will be equipped with the Craneworks BCN system and large display surfaces that welcome the customers. Sokos department stores, Emotion beauty and wellness stores and ABC gas station stores will implement digital advertising solutions based on these concepts. S-Group is a Finnish retail and service business network with more than 1,600 locations in Finland. The S Group comprises co-operatives and the Finnish Cooperative Society (SOK) with its subsidiaries. The S-Group offers the services of supermarket, department store and specialty stores, service station and fuel trade, tourism, catering and hardware trade. In addition, the branches of car trade and agricultural trade are found in some cooperative companies and S-Bank offers comprehensive banking services for all customer-owners. Craneworks is involved in the concept design, engineering and implementation of Digital Signage projects at the S-Group's outlets and sales network. We design, together with SOK Media, network display solutions and in all locations. We ensure digital advertising reaches eye pairs in the right places. Total deliveries include the introduction of the BCN system, installation of displays and media players, and after-service maintenance and after-sales service. S-Groups chains: Prismas, Sokos, S-markets, Alepas, Sales, ABC gas stations, Sokos -department stores, Emotion -beauty and wellness speciality stores, restaurants, hotels and S-bank. Craneworks's BCN Content Management System gained in an independent comparison the best score for usability and features. BCN is a reliable and easy-to-use platform for the S Group's digital advertising solutions.Craneworks supplies the S Group with a wide selection of the best displays, media players and other DS products. As a first project, more than 300 DS displays were done to all HOK-Elantos Prismas, S-Markets and Alepas entrances, which show the advertising of the S Group and other companies. HOK-Elanto has also delivered impressive 75" screens to the Emotion chain and special bright windows to the Alepa chain. 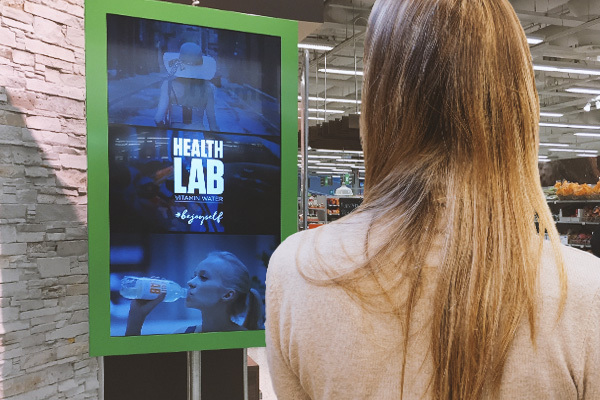 During the spring of 2018, we designed and delivered over 100 screens of Store Digital and the installation of Osuuskauppa Arina in eight Prismas. Implementation is a continuation of the S Group's national project, which disseminates the BCN solution to all locations. In addition, large 86-inch displays were installed on the Prismas main corridors. These large display surfaces attach customers attentions with a focus on digital advertising. 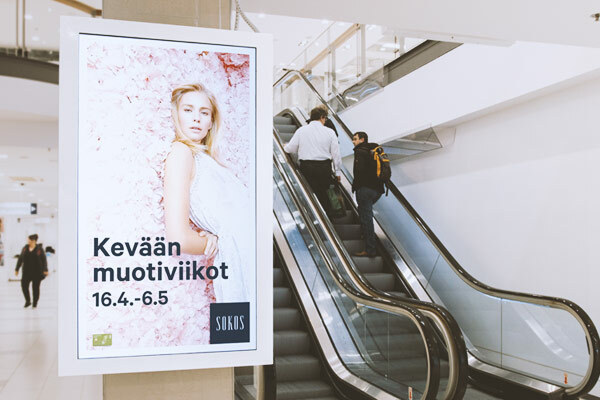 In the summer of 2017, we implemented the Digital Signage design and installation of the Sokos Jyväskylä and Sokos shopping center. 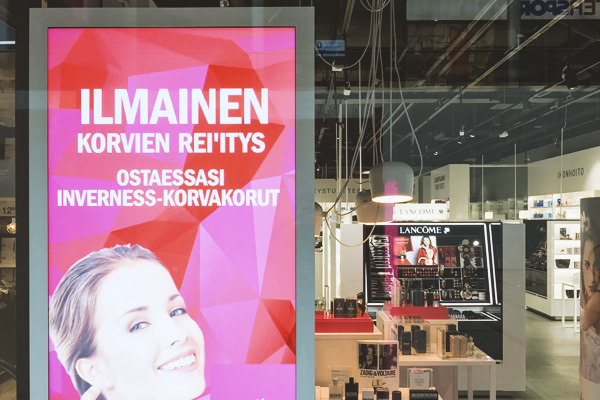 In the center of Jyväskylä, the Sokos department store and shopping center were fitted with 55-75 "screens and a spectacular 75" window display was installed in the pedestrian side window, in addition to the BCN Digital Signage system. Craneworks has also been involved in conceptualizing and implementing DS solutions to ABC, Emotion and SOKOS chains. 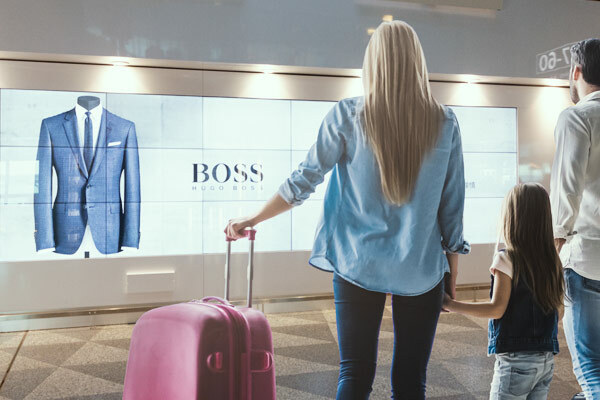 In particular, design has taken into notice the needs of chain communications, customer flows and chainwidth when the placement of the displays was decided. BCN's and SOK's Digital Asset Management integration facilitates S-Group content production. Content creators in the S-Group can search for material directly from DAM and publish and schedule it in BCN via one channel. 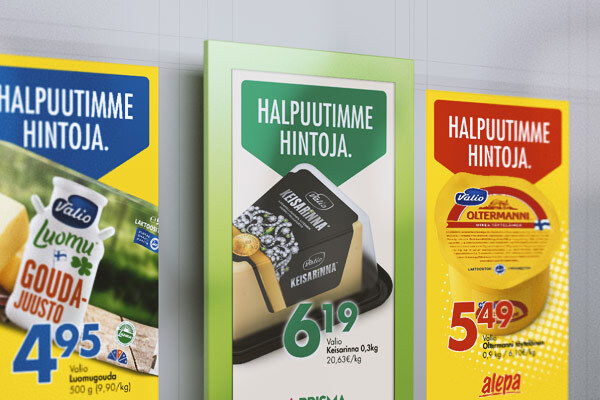 During the autumn of 2017, we implemented over a hundred display boards for Digital Store design and installation at the 37 offices of Osuuskauppa Varuboden-Osla Handelslagen. 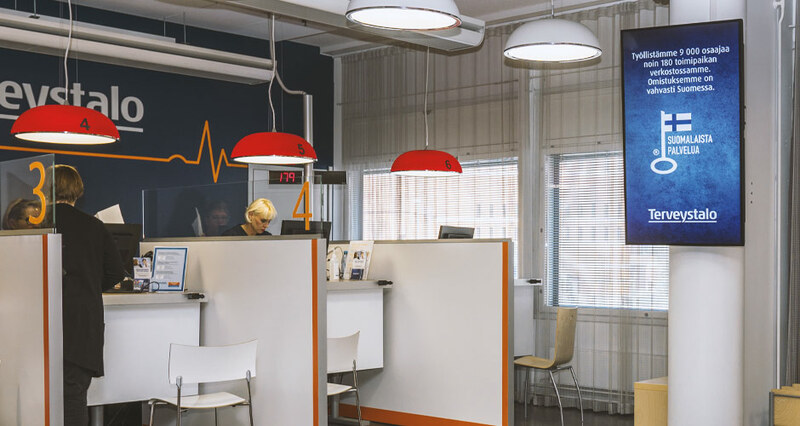 Implementation is a continuation of the S Group's customer relationship, where we have provided similar systems to several locations throughout Finland. 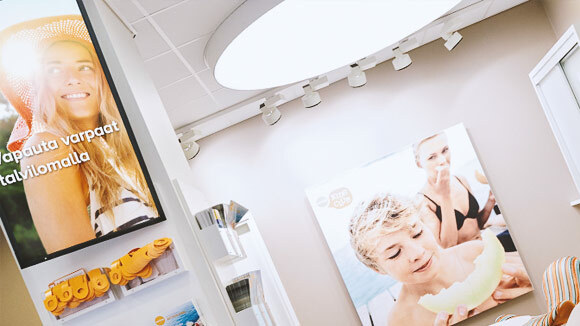 The first installations were made at VBO's three stores in Åland. After that, the remaining installations on the southern part of Finland were determined based on mapping. 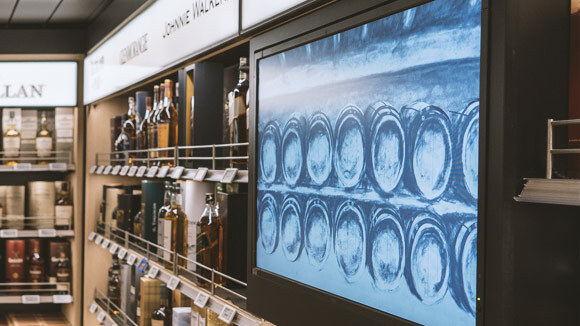 As a whole, the project lasted two months during which we delivered BCN Digital Signage systems to the Prisma, S-Markets and Salen stores. In addition to the delivery of the new system, we took care of the old system of the retail chain. The largest single display units were delivered to Kirkkonummi Prisma and Porvoo S-Market. Depending on the installation location, 43 '' - 84 '' enclosed displays were selected for the system. There were six pieces of 84 "screens installed at Prisma in the entrance and close to the Cash Points. With this system, VBO opens up a wider opportunity to communicate and advertise real-time in its commercial and public premises. Huge 108m² LED screen, which was build in October 2012, shines in Helsinki's best location, above Narinkkatoris main entrance to the Kamppi shopping center. Over 110,000 customers see the Wall's sharp and bright image every day. The Wall offers information and high quality advertising videos for passers-by, customers and passengers 24/7. Interactive special campaigns are also displayed on the screen. Craneworks implemented and built The Wall in collaboration with Kamppi Center Investments and Clear Channels. The ultra-sharp image and good color rendering of the LED display makes the Wall a landmark in Kamppi and Helsinki. Symhony and Serenade ships are practically sailing shopping and entertainment centers. The difference to the centers on land is just that customers spend more time on ships and expect more diversified services. 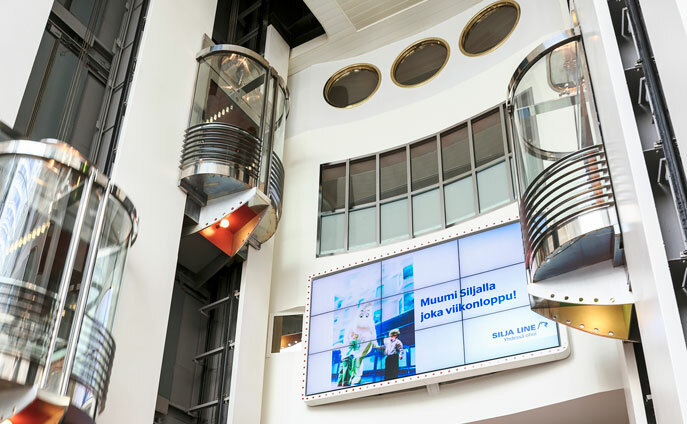 Craneworks executed the extensive and versatile Digital Signage and Wayfinding implementation with a total of more than 190 different-sized information displays during the Tallink Silja Symphony cruise ships upgrade. It included, among others, four large video walls, a large number of display screens, multiple touch-fitting Wayfinding screens, game screens for children and price lists and menus. In addition to the Silja Serenade infotainment concept that we have previously renovated, we also introduced new items to the Symphony, including Sushi & Company menu screens, Silja Land children's play screens, three infototems and 80 " display on the promenade, restaurants and Atlantis Palace. The whole system can be controlled both inside and out of the ship, so the contents of the screens can be upgraded wherever and whenever is needed. 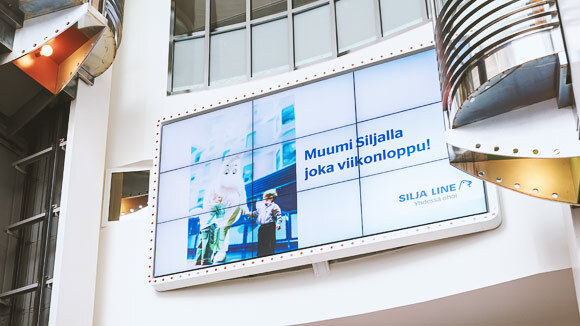 Craneworks implemented a wide and versatile Digital Signage and Wayfinding reform to the Tallink Silja Serenade, which included a total of 124 different size information displays. Among these are four large video walls, a large number of display screens, price displays, multiple touch-fitting Wayfinding guides and game screens for children. Tax Free Superstore monitors are campaigning for product launches for different suppliers with easy-to-upgrade advertising templates. The Grande Buffet's Buffet Signs provide information of buffet offers, which changes every meal from morning to night. The different restaurants and spa section displays work together in menu and advertising displays around the boat. The entire system can be upgraded and controlled both inside and out of the ship. The contents of the displays can therefore be upgraded whenever and wherever is needed, regardless of time and place. Tallink Silja changed the ship's internal advertising and information transfer to digital. This has been a good result with increased sales figures and increased number of participants in various ship events. In addition to its own media player, the Promenades 3x3 video wall is also connected to the multi-camera system inside Atlantis Palace. 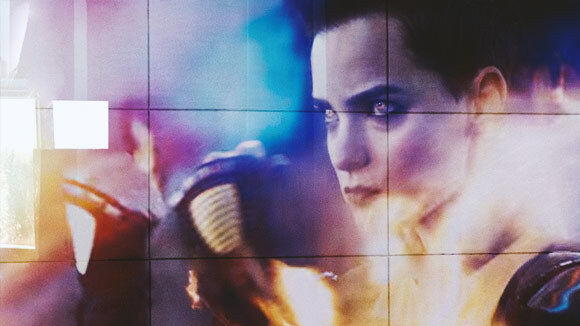 At the beginning of the performances, a live image can be directed to the video wall, thus attracting customers from the promenade to the nightclub. The camera system also serves the displays in the Atlantis Palace, which can be used to run ads and offers, and to show the stage performs at places that aren't close to the stage. The BCN Dynamic Wayfinding screens operates across the entire ship as a interactive guiding map. All 12 floors of the ship can be browsed, rotatable and zoomable in three-dimensional maps. The Wayfinding service guides customers interactively to the services they provide, as well as to the cabin, and delivers information about ship events. The Wayfinding service always calculates the shortest route to the desired destination, taking into account only the current routes in the calculation. For example, a broken elevator can be marked in the system for maintenance mode, so it will not be guided through it. The system also includes information on ship's facilities and events and guides customers in seven different languages. The ships have multiple menu screens that can easily be updated on a template basis from the BCN system. Some of the menus are passive and others controllable by touch. The renewed Siljaland is a place where children enjoy a safe environment and can play different games. The icecream bar in the area also ensures that children will enjoy while adults are shopping and enjoying other ship's offerings. Ships are full of different sized video walls. In addition to its own media player, the Promenade 3x3 video wall is also connected to the multi-camera system inside Atlantis Palace. At the beginning of the performances, a live image can be directed to the video wall, thus attracting customers from the promenade to the nightclub. The camera system also serves the info displays in the Atlantis Palace, which can be used to run ads and offers, and to show stage performances at places where is not a direct vision to the stage. Operation of the BCN system is possible, both from land and from the ship directly. Content and campaigns are being prepared in land, but the Craneworks tailor-made site-server system also enables quick response and changes from the ship even if the network connection to the main server is temporarily broken. Thus, the system is always usable and changes are always possible. Most of the largest shopping centers in Finland have made the right choice and selected Craneworks's most advanced products and services. Craneworks has implemented a variety of solutions to more than 30 Finnish shopping malls, some of which have chosen Crane as its main partner. 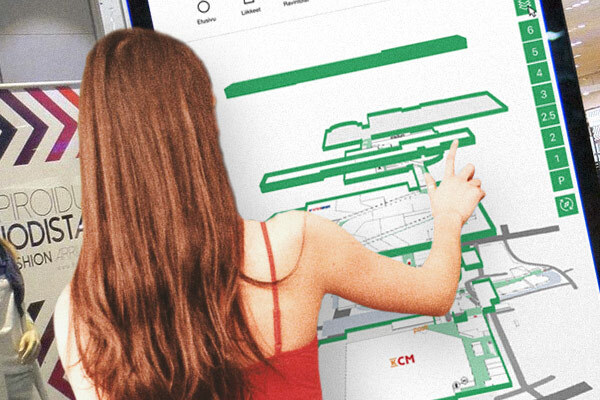 The Kamppi shopping center was the first to access the 2.0 version of Craneworks BCN Dynamic Wayfinding. The user-designed interface with pieteet is fresh looking and offers a better user experience. Effective guidance is very important in the Kamppi shopping center, where perceiving is hampered by several levels, floors and even buildings that are combined with the center. The center has over 40 million visitors annually, so the system needs to serve a wide range of needs and in several languages. We also developed a new menuapplication for Kamppi, which enables customers to browse the offers of the restaurants on the renewed fifth floor Kortteli restaurants. The touchscreen with Menuapplication is located on the E-level, in the Korttelis entrance door, and drives people to eat on the 5th floor restaurants. The new Wayfinding 2.0 version features a customizable front page, from which the customer finds easily and quickly what they are looking for using the keywords. The active touch area was optimized to make browsing easy. The development work also took into account the improvement of the map's functionality. For example, 3D rendering is optimized for maximum power, which makes map moving and routing instantaneus. 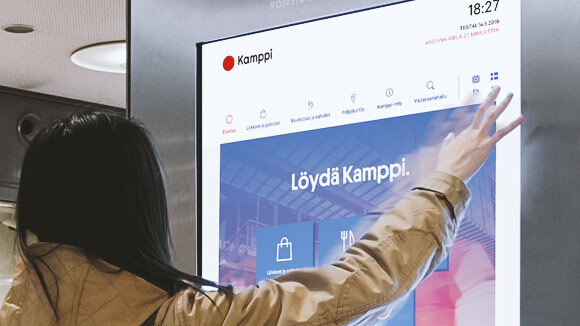 New media players and modern touchscreen technology were replaced to 23 display screens of Kamppi. In addition to updating old display totems, three new wall touch screens were added to Kamppi to extend the use of the system. 50 years of respectable age Makkaratalo's Shopping Center Citycenter renewed its DS look in collaboration with Craneworks in the spring of 2016. The massive totems of the shopping center were dismantled and replaced with 12 Ultra Slim 55" touch screen displays and three outdoor totems. The totems were placed in key locations both inside the shopping center, in the Saarinen yard and on the platform. In addition, the old display screens of the shopping center were utilized and they were built in 3x3 video wall at the entrance to Keskuskatu. 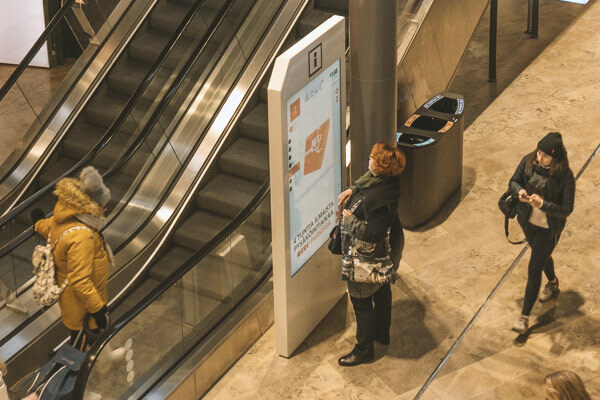 Citycenter also introduced the Craneworks BCN Dynamic Wayfinding system to serve the shopping center's customers to find the locations they are looking for. The graphical look of the Wayfinding user interface complies with Citycenter's brand with colors and year rings. In addition to routing, the system also displays public transport schedules and guides the customer to the right stops. In 2018 we upgraded Itis shopping centers Dynamic Wayfinding system to a new 2.0 version. Craneworks updated the digital look by delivering and installing three magnificent LED displays to the shopping center in December 2015. A large, over 28m2 LED display was installed at the shopping center's central square. 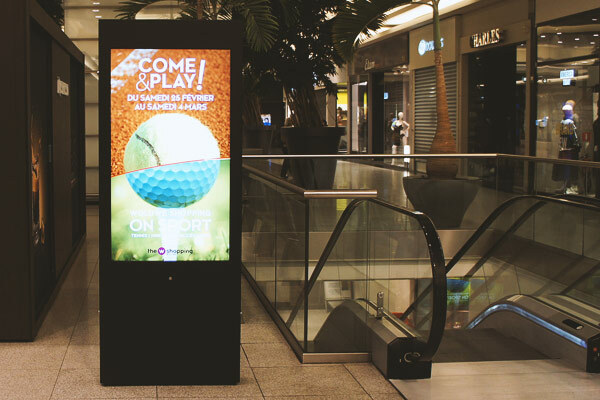 In the autumn of 2013, we delivered a marketing, information and guiding solution for five touchscreen totems in the shopping center Itis. We delivered hardware, installations and Digital Signage software. The mapping service of the totems was also updated in spring 2018 in the Craneworks BCN Dynamic Wayfinding 2.0 system. In summer 2018 We also delivered new hangind dual side LED screen in the middle of main avenue. Largest shopping center Ratina in Tampere is a common urban meeting place in the heart of the city. Bright combination of fashion, delicacy, daily shopping, interior design and beauty and health services. Over 100 shops and services in the city's best location. We delivered 12 pieces of touch screen to wayfinding, and we installed JC Decaux 70 "and 80" ad screen totems. 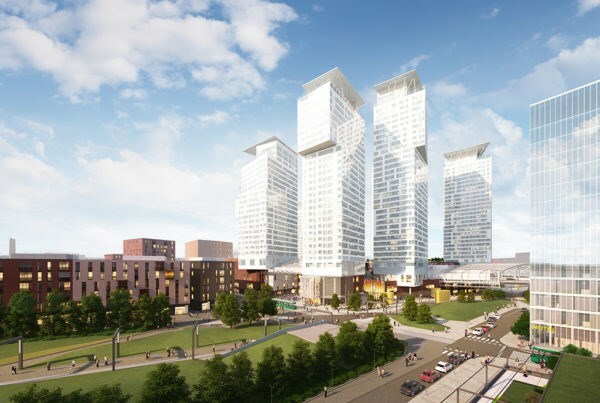 The Redi shopping center will be completed in autumn 2018 in Kalasatama, Helsinki. Craneworks has signed an agreement for delivering 10 LED screens to Red. Five of them are placed on Red's facade and 5 LED screens indoors. 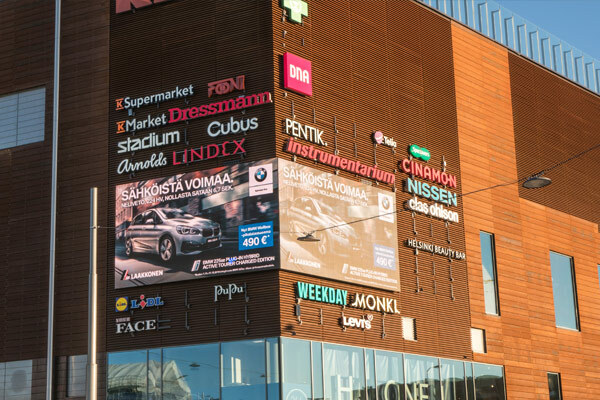 In autumn 2013, Craneworks delivered the BCN Digital Signage and BCN Dynamic Wayfinding software solution covering the whole Shopping Center's interior and exterior shopping mall to the new shopping center Kaari. The system will enable the Shopping Center to advertise, guide and inform customers in a new and modern way. 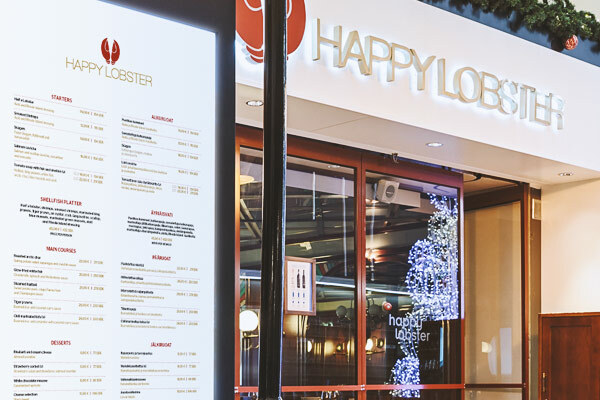 The system covers both the shopping center's general premises, the restaurant world, Sokos, as well as a number of indoor and outdoor LED displays. The shopping center staff operates their own info and advertising content. 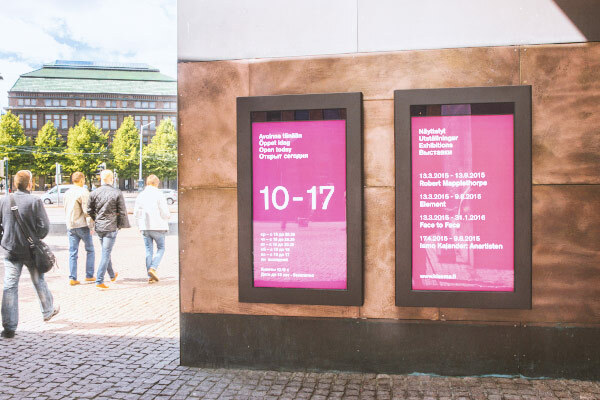 Selling advertising space to outsiders is handled by Clear Channel Finland. 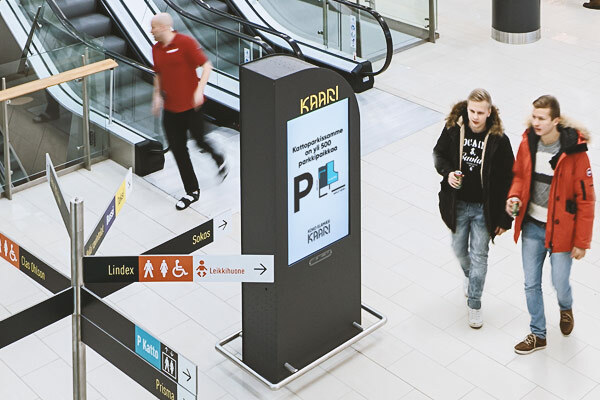 The Kaari on the touchscreen displays is the first shopping mall in Finland to have a presence sensor that automatically switches the ad display to a map view display as the customer approaches the screen. Over the years, Craneworks has been operating in the shopping center Iso Omena with several Digital Signage systems. 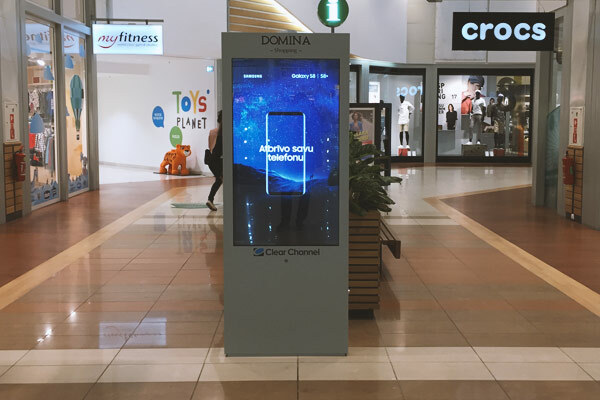 For example, installed JC Decaux's promotional items and also been involved in installing and consulting the Clear Channel indoor LED display installation. 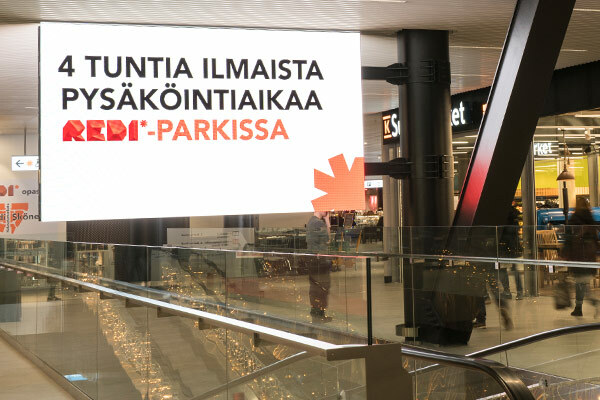 Craneworks delivered and installed new extra thin touchscreen totems in the summer of 2015 and the BCN Digital Signage shopping center Dix's first-stage facilities in Vantaa, Tikkurila. The delivered system is used as an advertising template and as an interactive touch screen if necessary. 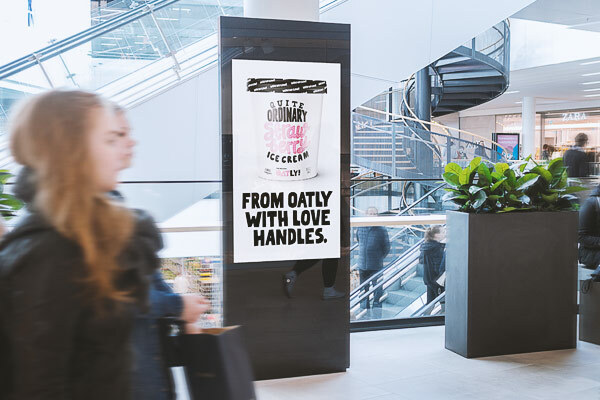 Craneworks delivered and installed new extra thin touchscreen totems in the summer of 2014, as well as the BCN Digital Sigange and BCN Wayfinding shopping mall Hansan premises at Hansatori in the heart of Turku. The delivered system works both as an advertising template and as an interactive touch screen. The new BCN Wayfinding map service was also integrated into Hansa's own web site. This way Wayfinding also guides customers through their own mobile terminals. Hyvinkää Willa, the seventh largest shopping center in Finland, renewed its digital look with Craneworks. Craneworks was commissioned for the BCN Dynamic Wayfinding guidance system for six digital infototems. Modern digital wayfinding now serves customers in Hyvinkää center on both sides of Willantori. The project was implemented in spring 2018. 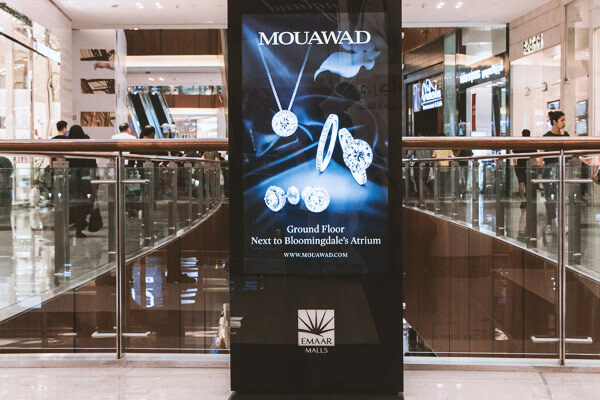 Craneworks delivered 25 pieces of 2-sided information display totems to the world's largest shopping mall, owned by Emaar, Totems were tailored and manufactured to meet Emaar's special needs. The Latvian Shopping Center Domina is located in Riga, Latvia's capital. Domina chose Craneworks BCN's Dynamic Wayfinding shopping mall as a digital info and guidance system. 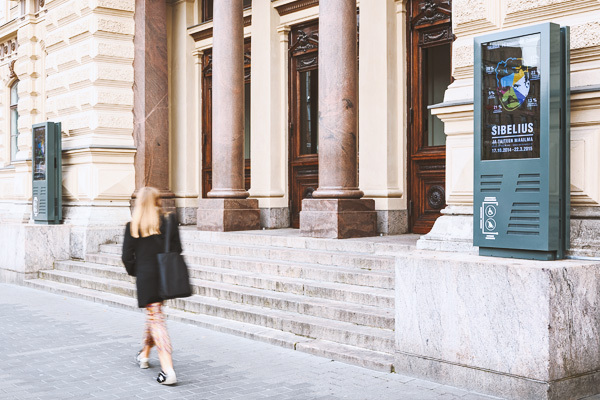 The implementation was carried out in cooperation with Clear Channel Latvia. 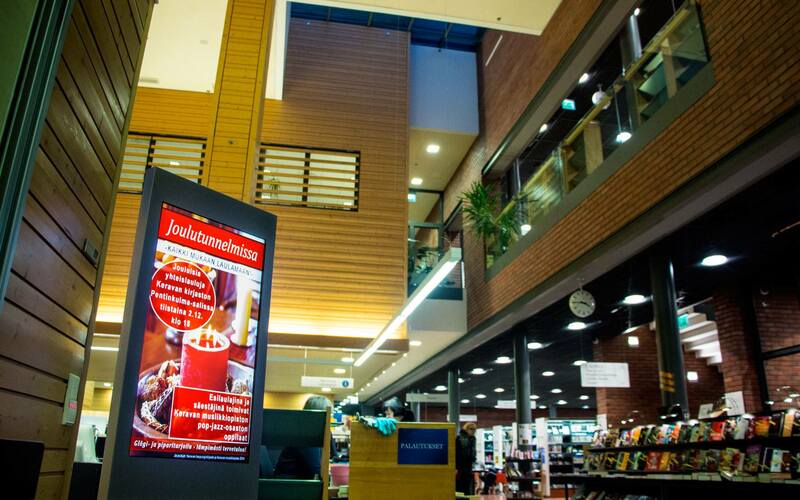 In 2012, we implemented an information display solution at the shopping center Veturi in Kouvola. In the solution, the touch screens were integrated into the shopping center's large indoor guide totems base, where touchscreens are located. 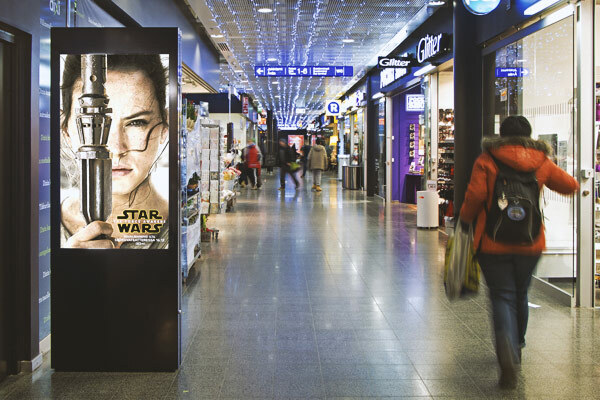 Craneworks provided hardware, installation and Digital Signage software.. Shopping center Veturi is owned by Kesko and advertising time is sold by Clear Channel Finland. The Woluwe Shopping Center in Brussels, Belgium, chose Craneworks's BCN Digital Signage and Dynamic Wayfinding systems for the digital advertising, information and guidance of the Shopping Center. The world's largest outdoor advertising companies have chosen Craneworks's most advanced products and services. Craneworks has implemented various Digital Solutions solutions for more than 30 Finnish retailers in cooperation with leading foreign advertisers. Digital Outdoor advertising -DOOH is strongly in Craneworks DNA. We have developed our knowledge, software and processes to meet the broad and constantly changing needs of external advertisers. Together with our best partners, we can transform your Digital Signage project into a highly profitable revenue stream. Sharing the media space with the outdoor advertiser brings considerable revenue through advertising. BCN Digital Signage, BCN Dynamic Wayfinding, Videowalls, Infomonitors, touchtotems, LED-walls, special projects, Augmented Media, installation and maintenance. 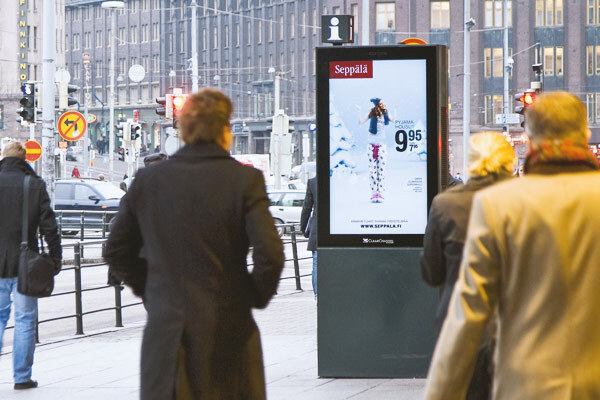 We have been collaborating with Clear Channel Finland for Digital surfaces since 2006. All the first digital implementations of Clear are done by us. We have installed Down Town Digital Outdoor Display Network, LED displays, Indoor Screens, Infototems, Video Walls and also have maintained their DS network for years. In addition, over the years, we have implemented a large number of Augmented Media special campaigns, together with Clear and their customers and partners. 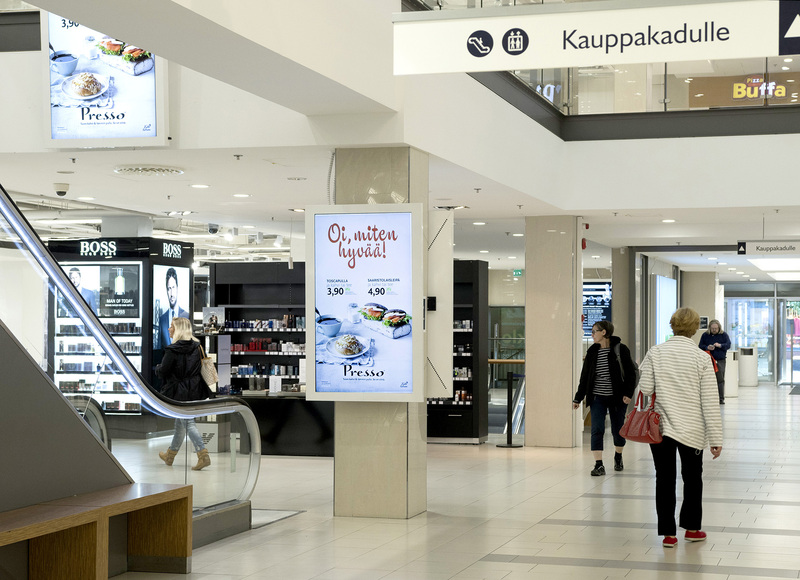 We have installed the JC Decaux shopping center network with 70 "and 80" infototems around the Finnish shopping centers. A total of 16 different shopping malls, and installed a super-wide LED display of the Helsinki Rautatietori compass-level. We also installed the Digital Signage and Wayfinding implementation of the Kauppakeskus Ratina shopping center opened in spring 2018 in Tampere, in co-operation with JCD. 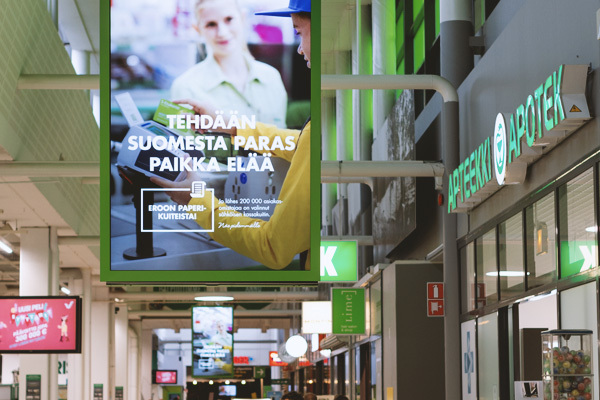 The Mediateko operates nearly 40 different golf centers and sells them Digital outdoor advertising with Craneworks BCN system around Finland. The Latvian Shopping Center Domina is located in Riga, Latvia's capital. Domina chose Craneworks BCN's Dynamic Wayfinding shopping mall as a digital info and guidance system. 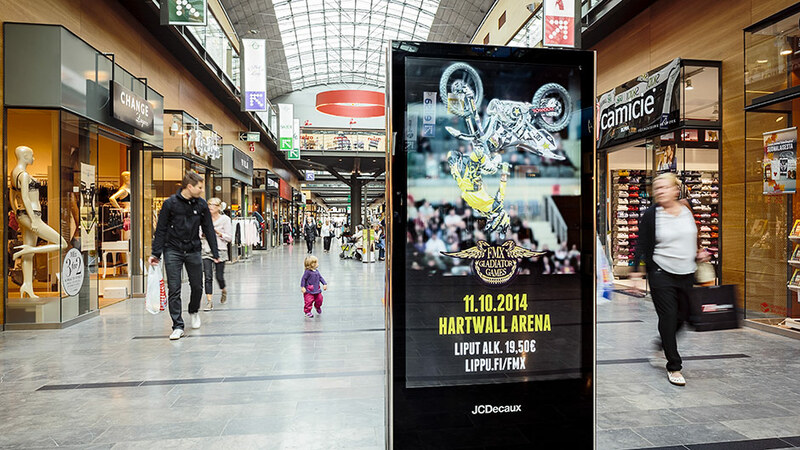 The implementation was carried out in cooperation with local Clear Channel Latvia. Craneworks products can be found at Helsinki-Vantaa airport from many different places. 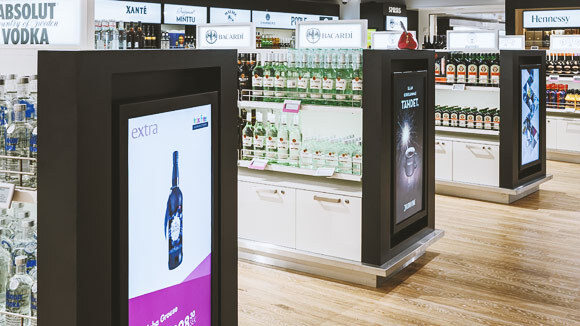 Craneworks has designed and installed several state-of-the-art Digital Signage solutions at Helsinki-Vantaa Airport. Helsinki-Vantaa International Airport has an entrance to Finland and an important hub for Asian traffic. More than 40,000 passengers can see offers and information on DS monitors every day. The solutions have been implemented in cooperation with Clear Channels, Finavia, Finnair, HMS host, Martela, UPM-Plywood, Karelia-Upofloor and Fortum. Helsinki-Vantaa has been voted the best airport in Northern Europe in 2018 at SKYTRAX World Airport Awards. Finavia is a Finnish airport company that enables smooth flight connections to the world through its airport network covering the entire country. Finavia's core business is the operation of airports. Over the years we have implemented to Finavia a wide range of Digital Signage implementations, system integration and system maintenance. One of the most spectacular is the video walls in the outer wall of the T2 - Taxfree area, a bigger 3x6-inch super-video video wall is one of the great examples. The video wall can be run on every two separate 16/9 adverts or as one high resolution 4K surface. Sound showers also make it possible to use directed sound as part of an experience. 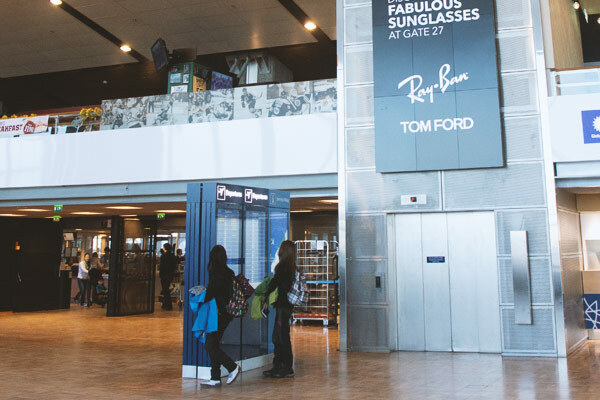 Craneworks transformed an old-fashioned and static ad slot at Helsinki-Vantaa Airport to the dynamic Digital Signage video wall. In Terminal 2, the video wall near the exit port 30 is made up of nine Samsung's 55 "full HD LCD screens. 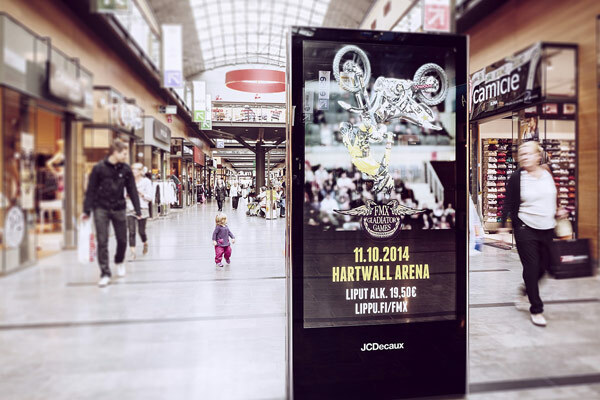 Craneworks implemented the video Wall with Clear Channel Finland in spring 2015. 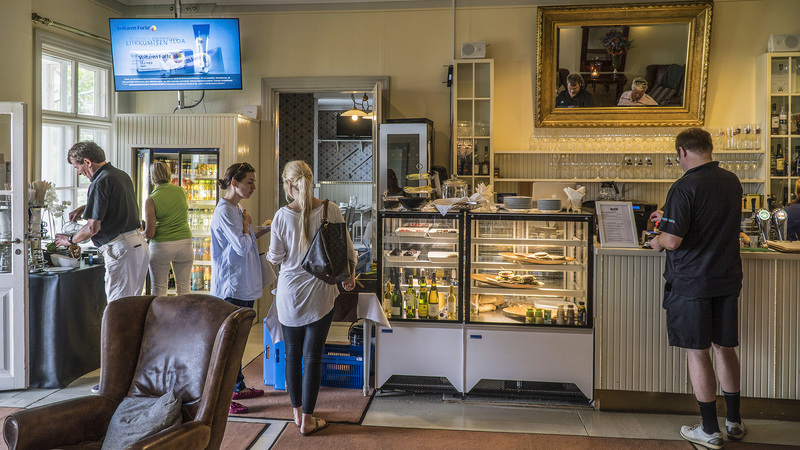 Craneworks delivered and installed Helsinki-Vantaa Airport's Arctic Bar HMS host video show in the spring of 2015. The Scandinavian drink bar is now inspired by six 55 " 16: 9 full HD LCD monitors. Videowall is an eye-catching spot with a Aurora borealis kind of light terminal at Terminal 2 gate 30 on the second floor. 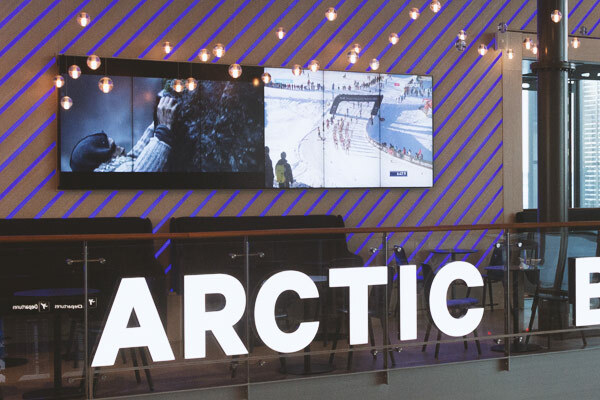 In addition to the Videowall, Arctic Bar now has two display totems, from which customers can get up-to-date information on restaurant products and prices. 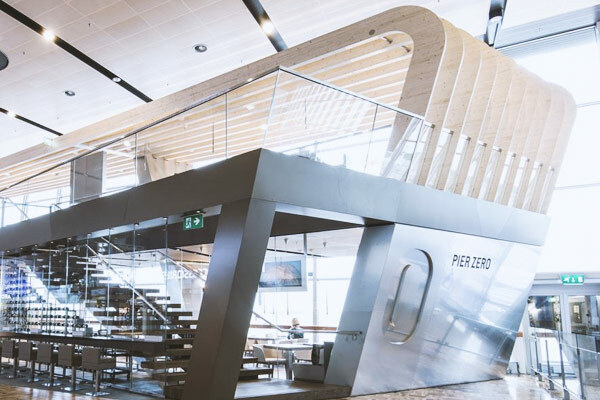 HMS host Pier Zero is undoubtedly the most spectacular restaurant in Helsinki-Vantaa Airport. We delivered information displays to promote restaurants offers. 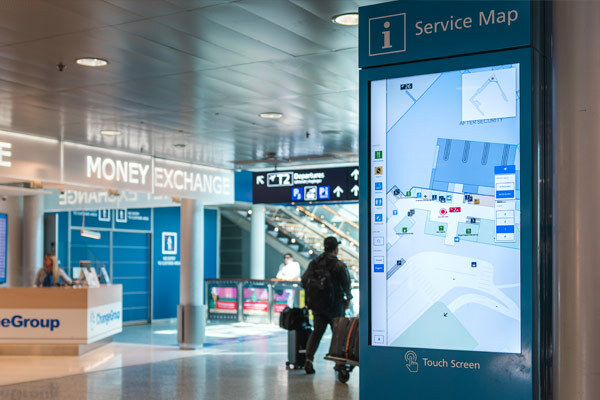 We piloted with Finavia on two Touch totems together with Futurice, Wayfinding's possibilities at the airport. Futurice's terminal map shows the offers of different businesses. 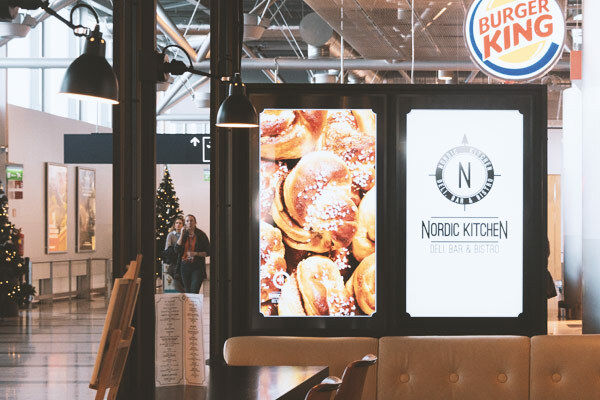 The HMS Host's Nordic Kitchen is the terminal 2 of one of the largest restaurants in the Non Schengen area and offers Nordic flavors for many tastes. Craneworks delivered and installed displays and sound system for the restaurant. 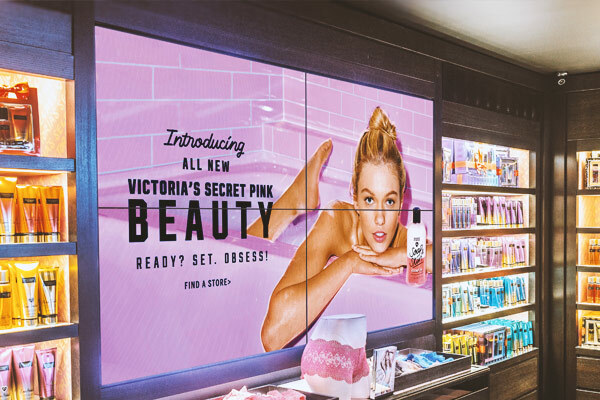 The first Finnish Victorias Secret store at Helsinki-Vantaa Airport received a small 2x2 videowall and a few other info displays delivered and installed by Craneworks. Digitality raises attention and promotes sales and differentiates it more effectively from the offers of other stores. 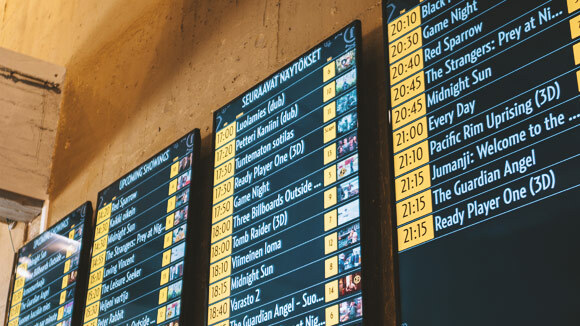 Finnkino's Digital Signage system has been built, tailored and maintained by Craneworks since 2006, the largest movie theater chain in Finland. The Aulakanava offers advertising to Finnkino's theaters, as well as movie trailers and interactive experiences of new, upcoming films. 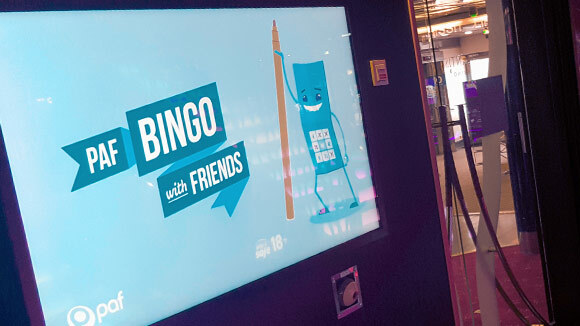 Craneworks has implemented Digital Signage for Finkino, including: ticket sales screens, video walls, specialty LCD and LED window displays, cinemas gates screens (door rails), offer and product sales displays, and other advertised surfaces and touchtotems for games and special campaigns. A large part of daily content is automatically generated on screens. The BCN Digital Signage system is integrated with Finnkino's own backround systems. 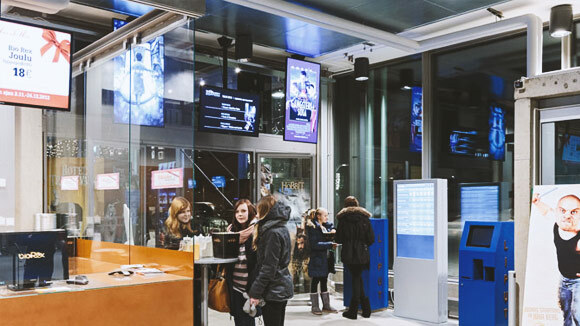 Kuopio Scala operates in 2012 as a pilot for Finnkino's other theater digital signage projects. 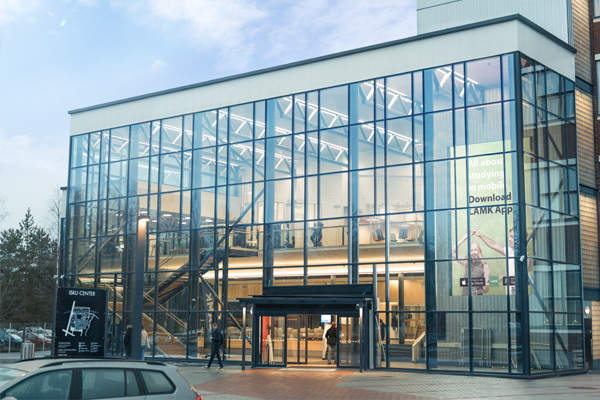 Craneworks implemented a major DS reform for Finnkino Tennis Palace in 2015. 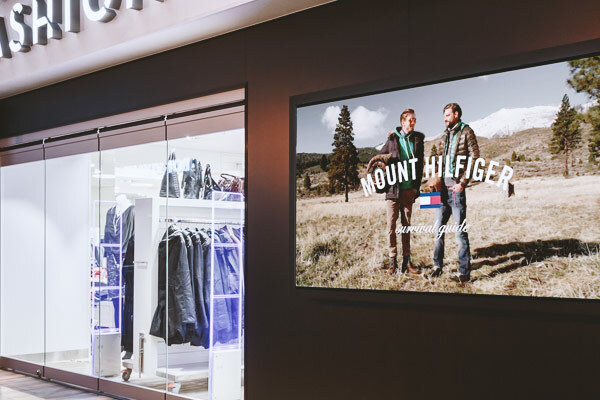 During renowations Craneworks delivered and installed to Tennispalatsi nearly a hundred Digital Signage screens, including video wall, specialty window displays and LED display in the show window. Advertising and information for Tennispalatsi is handled by Craneworks's BCN Digital Signage Content Management System. For example, movie schedules and theathers can be easily and comfortably presented to customers through a customized template by Craneworks. The BCN Digital Sigange system provided by Craneworks is also integrated with the Finnkino backend system so that most of the content is automatically presented in accordance with the information from the backend system. Finnkino theaters are full of different displays ranging from single screens, from screen sets to large video walls and outdoor and window LED displays. Different display surfaces serve customers in a variety of roles: customer information, ticket sales, mood creation, suplemental sales, media sales, and movie trailer support for distributors. Most of the content displayed on the Finnkino screens is automated. The HTML5-based templates of our BCN system have been programmed to automatically display ticket and location situations from different screens, controlled by data from Finnkino's backend systems. Product advertising is also implemented with ad templates that only update product and price information and images. The starting movie and the next movie information on the theaters Gate displays will also be updated automatically. Content automation saves a lot of work hours in content management. During the spring of 2017, we also delivered 65 "touch screen totems to every Finnkino theater. The totems are equipped with Kinect cameras and sound showers, as well as proximity sensors. Totems work as a platform for a variety of interactive special campaigns where distributors and advertisers can promote their own products and movies. Kinect cameras also feature audience measurement that provides Finnkino with important data on number of audience, age distribution and gender distribution at different times of day and week. This makes advertising much more focused. Craneworks' Digital Signage and Wayfinding solutions are perfect for performing arts and for informational purposes of arts and cultural institutions. 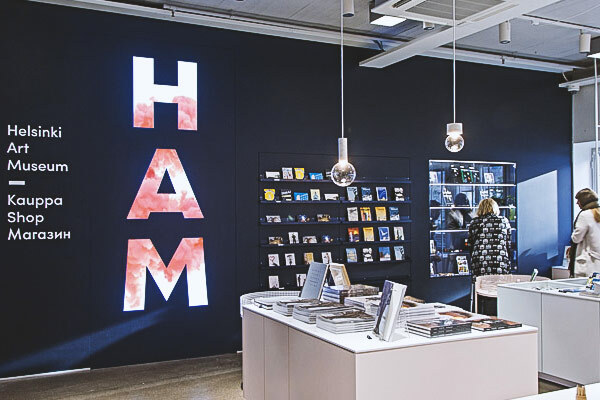 Helsinki Art Museum HAM is a great example of the creative uses of Digital Signage. The HAM letters built from the three 55-inch displays in the museum store serve as a digital design element. In connection with ticket sales, the museum's second digital wow experience - a moving image projected onto a transparent wall. Outside the museum, the outdoor totem, advertises for example exhibitions, open doors and opening times. Craneworks has planned the implementation together with the Helsinki Art Museum. The content and campaigns of HAM's digital solutions are managed through the Craneworks BCN DS system. Craneworks was also responsible for the installations. 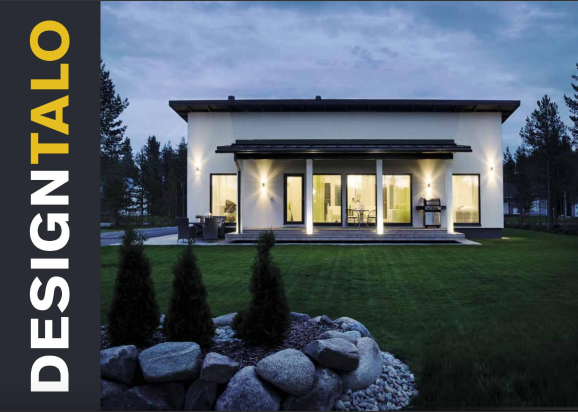 HAM is the first in Finland to feature a 75 "two-sided Infinitus outdoor design. Its screens are extra bright, so the picture shows and looks good in any weather. 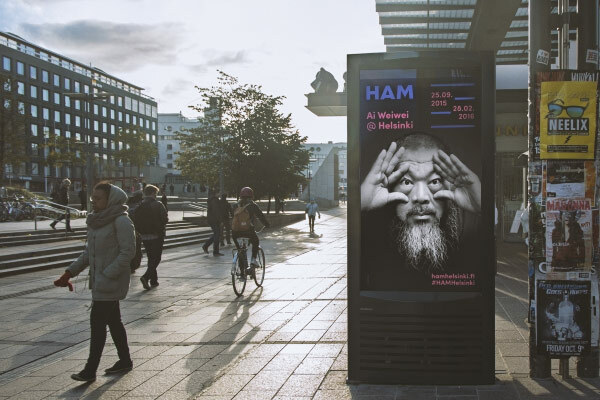 The size, image quality and central location of the totem ensures good visibility for HAM's campaigns. During the years 2013-2014, Craneworks implemented the Ateneum Art Museum at two stages in the Digital Signage indoor and outdoor use. 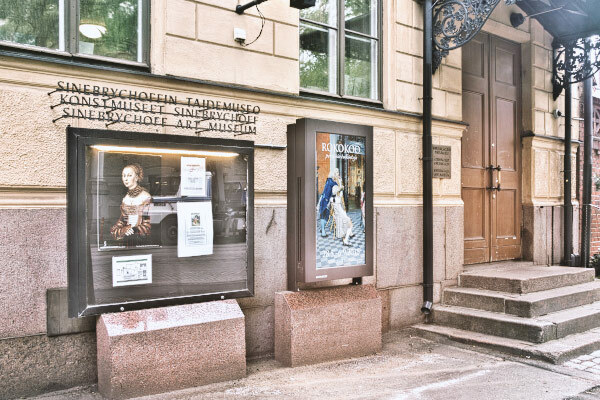 The outdoor solution consists of three high-bright outdoor display to communicate to passers-by about Ateneum's offers. The totems are located on both sides of the museum building. 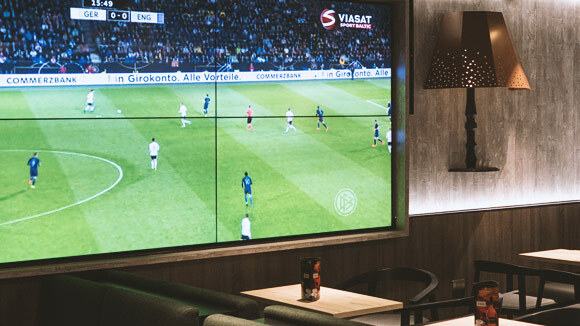 Inside Digital Signage solution comprises a video wall and a number of individual information displays and touch screens in connection with ticket sales point. The leading contemporary art museum in Finland and neighboring areas Kiasma is now also modern in digital communications when Craneworks introduced the Digital Signage to the museum in spring 2015. It includes indoor and outdoor displays. Two hig-brightness displays located on the outer wall of the museum, attracts the attention of passers-by and museum tourists. The displays show information about the museum's opening hours, exhibitions and events. Digital Signage seamlessly adapts also to the old and valuable environment. The Sinebrychoff Art Museum took over the Craneworks BCN Digital Signage system in spring 2015 to enhance its information. The system includes two 24/7 professional displays, one outdoors and one inside. In addition to the entrance on top of the stone stairway, the specially designed outdoor display communicates to the passers-by of the museum's exhibitions, opening hours and events. Craneworks' Digital Signage solution is available at the two headquarters and extensive service network of LähiTapiola. During inventory upgrade, screens were designed and placed in windows and client waiting rooms. 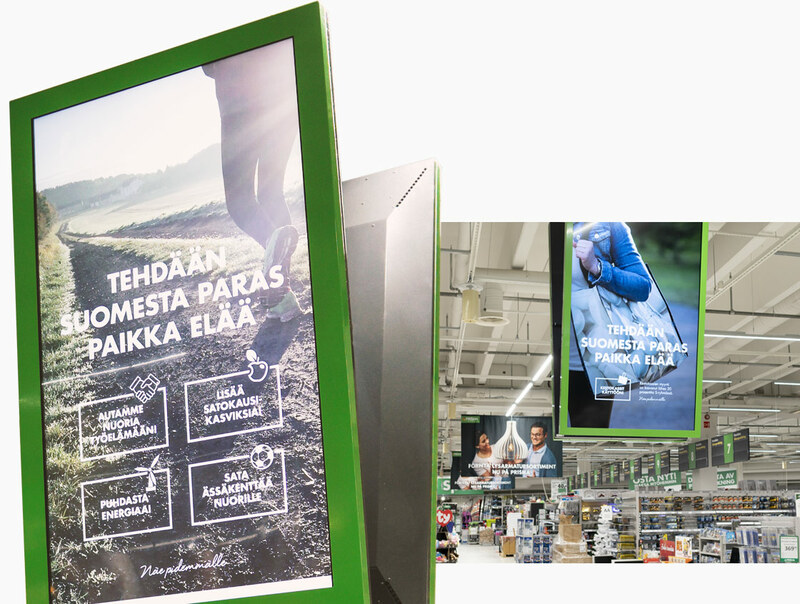 Informative Digital Signage displays pay attention to the customers, providing entertainment and information about LähiTapiola products and services. 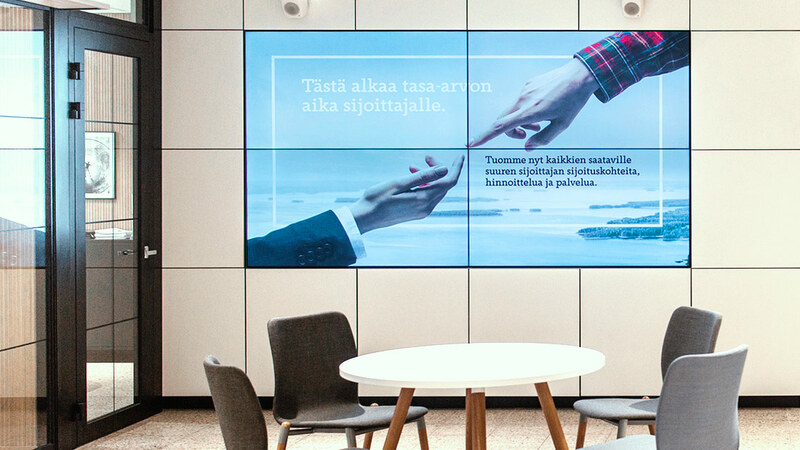 In connection with the Iso Omena expansion, Craneworks delivered the "Life Safety" concept screens consisting of a large window display, conference room displays, a large video wall and six separate displays to the LähiTapiola lippulaiva store. 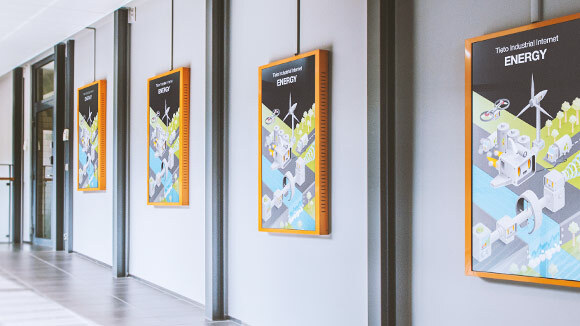 In the spring of 2018, Craneworks delivered the public spaces of the Turku Life Safety office premises - high bright window displays and video wall. 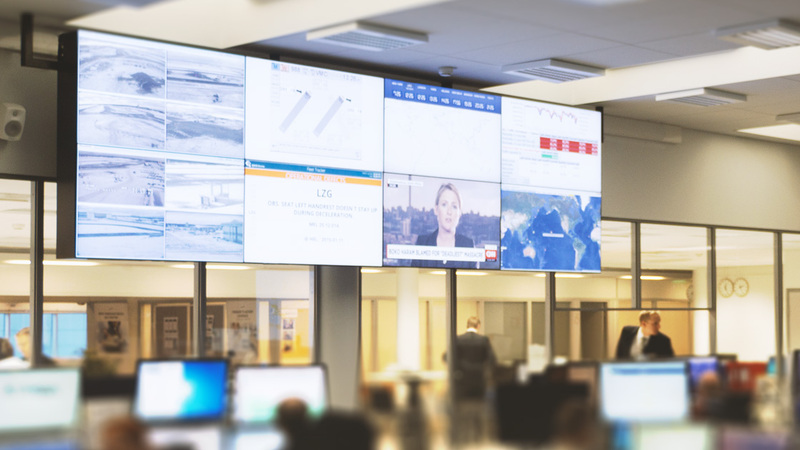 Craneworks tailored to Finnair's new Operational Control Center (OCC), a new type of Digital Signage / Control Center solution that enables OCC staff to simultaneously monitor multiple data sources with a large 2x4 video wall, as well as separate individual information displays. Behind the system is an iPad-controlled matrix / scalable solution and tailor-made Craneworks own BCN Digital Signage system that enables OCC employees to choose suitable source for monitoring various monitored scenarios for viewing on different screens on a video wall. Craneworks made integration in the OCC project with a variety of sources of information. These include Finnair's Twitter feed, flight details, Finavia cameras at the airport, international news channels, event information channels, fleet status displays, departures and arrivals, etc. 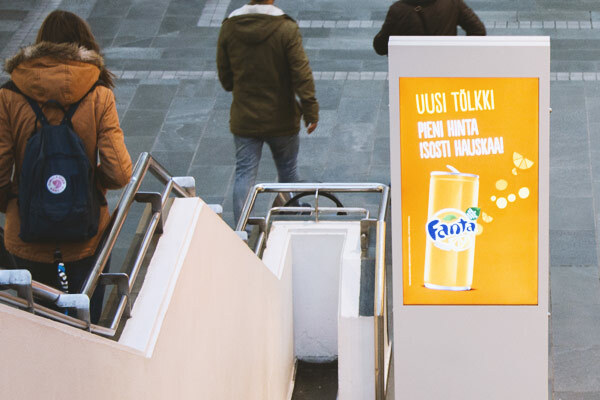 Craneworks implemented Terveystalo's digital advertising and communication channel in twelve different cities around Finland in 2013-2014. Through a comprehensive communication channel, Terveystalo can flexibly publish its own information, as well as their own and partner affiliate ads on customer premises. In 2017-2018, Terveystalo ordered Craneworks DS displays for their new offices. A total of 16 displays were installed at the Helsinki Metropolitan Area and 11 in Eastern and Central Finland locations. The aim of the project was to standardize and renew marketing campaigns and to open up more digital communication channels to different units. The system is managed centrally from Helsinki's main office. With the system, units can also generate their own local content for DS channels. In the early stages of the construction of the Shopping Center Redi, information on the SRV construction site was updated to digital format. With the Craneworks DS system, the construction site quickly responds to weather conditions, informs security issues and, if necessary, promotes the day-to-day offers of construction sites canteens. Craneworks has also provided SRV's headquarters for the DS system for internal communications. In 2012, Craneworks designed and implemented the Digital Signage implementation of Oy Aurinkomatkat - Suntours Ltd Ab. DS monitors were installed as part of the décor for customer waiting rooms in many locations. In addition to regular travel advertising, we also program dynamically updated content on the system, where the Aurinkomatkat web site updating the fast trips and hotel offers are also updated on Digital Signage screens at various locations. Tieto's new Keilaniemi headquarters aim to create the best possible environment for innovation and startup support for communal and flexible working methods. Craneworks delivered the DS system to the new premises. 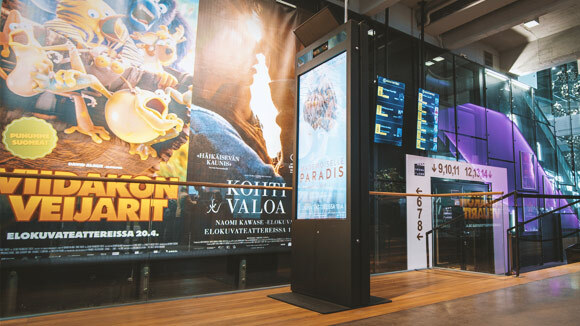 Craneworks' Digital Signage system is used in Biorex cinemas in Espoo, Kajaani, Porvoo and Hämeenlinna where it offers the film lovers a modern way to enjoy movie trailers and product advertising in the lobby. PAF operates its gaming business on Tallink Silja's vessels and Åland in its own Casino gaming areas. Craneworks has provided these sites with games promoting the Digital Signage system and a variety of template based content creation solutions. Elenia Oy, a service that provides energy, provides customer service for electricity, district heating, natural gas and electricity sales. 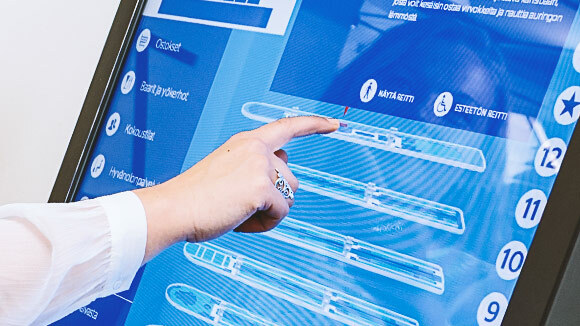 Craneworks provided Elena's internal use of the Digital Signage system, which provides employees with information about Intra and current informations. In Helsinki, Tampere, Lahti and Jyväskylä there are double-sided outdoor displays at the most important center locations. These display themes bring attention and provide map services and show ads to passers-by. 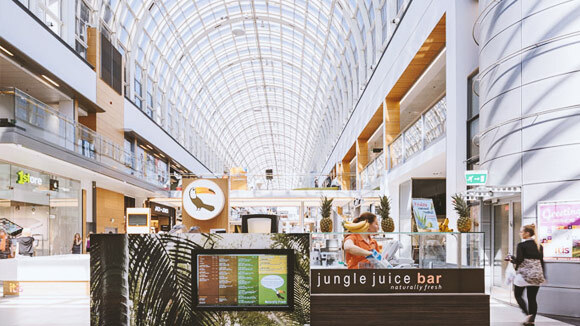 The Jungle Juice Bar chain from the Lions Den program has chosen Craneworks as the BCN Digital Signage service to boost its sales. The rapidly expanding chain currently operates in 11 different locations in Helsinki, Espoo, Vantaa, Turku, Tampere, Lappeenranta and Kuopio. At the end of 2016, Craneworks delivered the Design House DS system in co-operation with Inmics. There were large 75 '' displays and smaller 55 '' displays in the conference rooms at Vantaa's Pakkala office. The Craneworks BCN system is in use at the Design House at other locations. 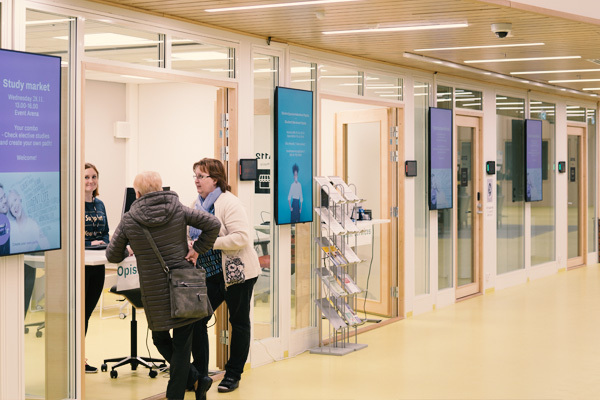 The Kerava Library introduced the Craneworks BCN Digital Signage system. 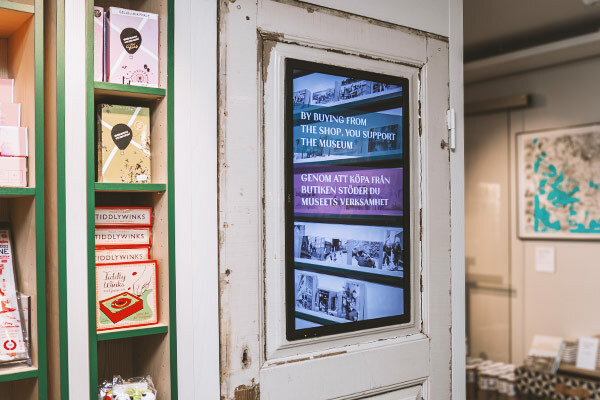 Delivery included, Inside displays, display totems, and specially-sized window displays to inform to passers-by of library events. 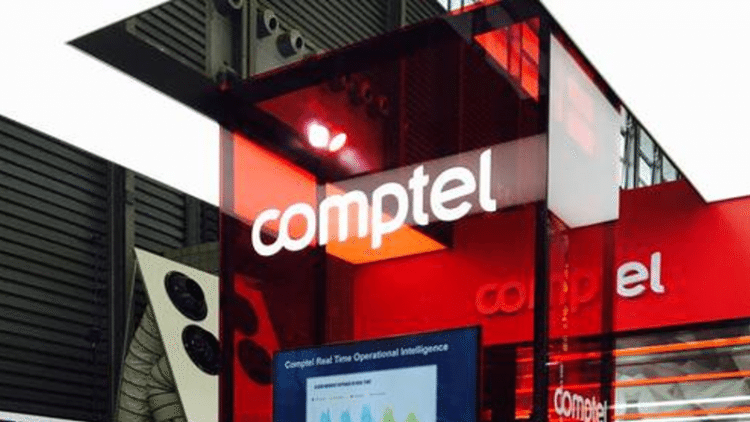 Comptel uses BCN Digital Signage in its internal communications in different offices around the world. There are offices in Finland, Italy, Bulgaria, India, the United Kingdom, the United Arab Emirates, Brazil and Malaysia.